Kimcheelicious: Meet Kimcheelicious at the Kickstarter Block Party! 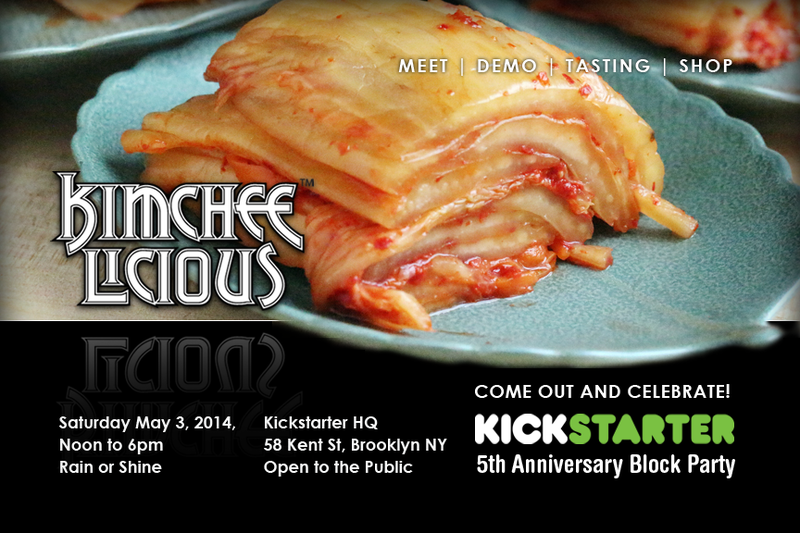 Meet Kimcheelicious at the Kickstarter Block Party! Come out and celebrate Kickstarter’s 5th Anniversary on Saturday, May 3! Kimcheelicious is proud to have been selected as one of their favorite crowd-funded projects. This block party is open to the public and goes from noon until 6PM, rain or shine. Join me and other selected Kickstarter project creators for an afternoon of food, games, art, demos, live music and more! There will be a tour of their new head quarters at 58 Kent St. in Greenpoint, Brooklyn. Let’s meet! Stop by the Kimcheelicious kiosk for food demonstrations from my ePUB cookbook and kimchee tasting. You can even buy a jar or two; I’ll have vegan Napa cabbage kimchee, fermented Korean radish and Korean chili paste. I’ll also be demonstrating how to make kimchee and miso and raffling-off the demonstration jars to a few lucky winners. Recipe: Chickpea Ssamjang for Lunch!